Challenge In transcranial MR-guided focused ultrasound treatments (MRgFUS), a high intensity ultrasound transducer is used to create a region of necrosis at a focal location in the brain with an intact skull. Variations in the shape, thickness and density of the calvarium can cause aberrations in the location and shape of the beam’s focus. Current Techniques CT imaging is currently used clinically to correct for these aberrations. Approach In this work, we use ultra-short echo time (UTE) imaging for imaging the skull, specifically using rapid automatic segmentation (region-growing segmentation and K-means clustering) of cranial contours to provide phase-aberration correction information for MRgFUS planning and correction in the brain. 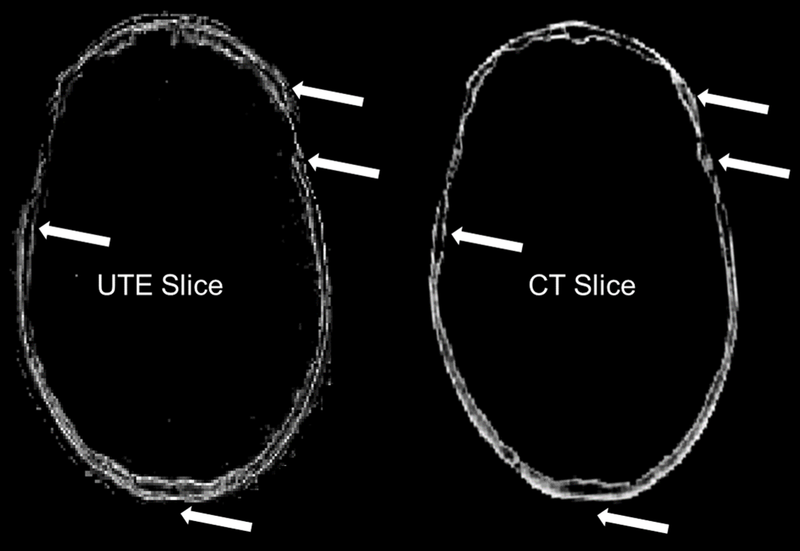 Figure below compares the MRI (UTE imaging) slice and the CT for the same subject, showing similarities in the image features detected. We find that phase aberrations predicted from bone contours using UTE images resulted in recovering 75% of the total focal intensity (neglecting losses due to attenuation). Urvi Vyas, Ethan M Johnson, John Pauly and Kim Butts Pauly, “3D UTE Imaging for Phase Aberration Correction for Transcranial MR-guided Focused Ultrasound Surgery: Comparison of the segmented bone contours and corrected phases with CT” ISMRM:263. 2014.